Looking for a new luxury sedan? You might be overwhelmed with all of your options. Are you stuck trying to decide between some of the country's most popular sedans, such as the Lexus IS, the Audi S6, the BMW M5, and the Mercedes-Benz C63? Trying to compare every feature of every new sedan for sale in Calgary is not only difficult, but also time consuming. The team at Lexus of Calgary wants you to be informed before you purchase your next luxury vehicle, so we've created a head-to-head comparison of the 2018 Lexus IS, the 2018 Audi S6, the 2018 BMW M5, and the 2018 Mercedes-Benz C63. 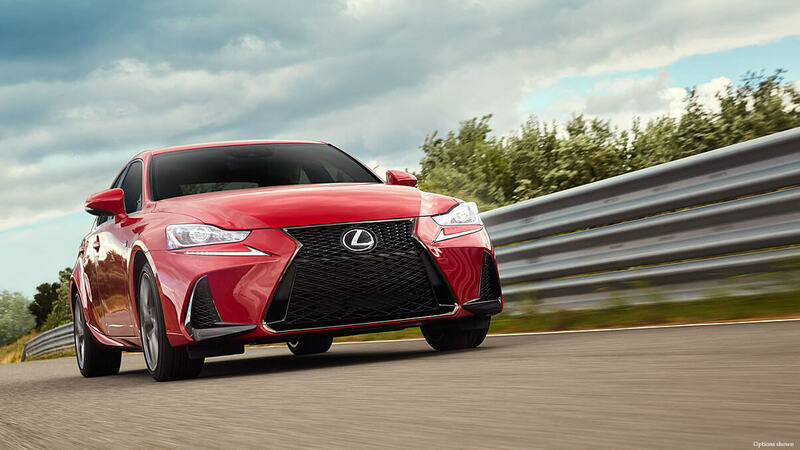 The 2018 Lexus IS is one of the more reasonably priced luxury sedans on the market, especially considering that it holds up against its competitors in every way. If you're in the market for a top-tier luxury vehicle without breaking the bank, the Lexus IS is a great choice. The efficiency of the Lexus IS ranks in the top of the market when it comes to fuel efficiency. Remember, there are several factors that contribute to fuel efficiency. These include how aggressively you drive, excessive idling, how quickly you stop, how much cargo you have, and more. 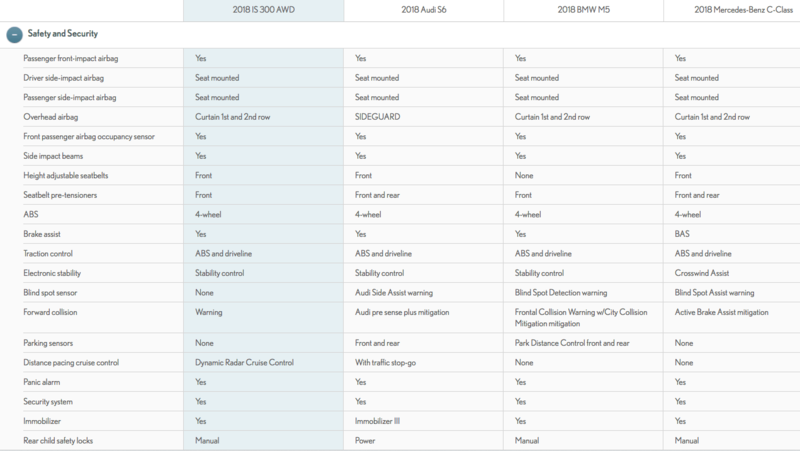 Fuel economy is measured under controlled conditions by the EPA, and the table below gives you a good idea of how the Lexus IS compares to similar models. Safety is a top priority for everyone, no matter which vehicle you're driving. You really can't go wrong no matter what luxury sedan you choose from in terms of safety features. The Lexus IS, Audi S6, BMW M5, and Mercedes-Benz C-Class all boast four-wheel ABS, driver and passenger airbags, and a traction control system. If you're on the highway a lot and distance pacing cruise control is an important safety feature you're looking for, you may be drawn to the Lexus IS. There are so many factors to consider when choosing the vehicle that's right for you. Each Lexus of Calgary guest has specific needs and wants for a vehicle that will fit their lifestyle. These additional specifications look at a combination of a few comfort, safety, and power features that may help you in your decision-making process. We hope that our head-to-head comparison between the 2018 Lexus IS, the Mercedes-Benz C63, the BMW M5, and the Audi S6 gave you better insight into the new Calgary luxury sedans available on the market. Want to learn more about the 2018 Lexus IS? Reach out to our team with any questions you may have about this impressive vehicle. And if you're ready to take the next step, schedule a test drive to feel what it's really like to drive a vehicle this awesome.